If I can find any live fish, I won’t have a second thought of making a steamed fish. Nothing can beat the taste of the fresh fish meat. You barely need any seasonings, just sprinkle a bit of salt and pepper, then steam it with ginger and spring onion. Drizzle with a bit of soy sauce. It’s delicious. If it happens not to get any fish that is fresh enough to steam, this way of cooking will do the trick. 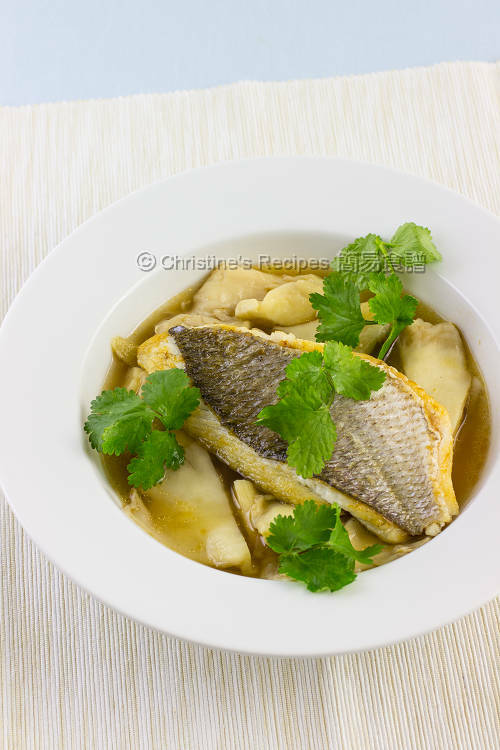 Simply pan fry the fish first, then go with a tasty soup base, added with an Asian touch in a modern presentation. The family was enticed to taste the dish and it’s gone very quickly. The most important part of cooking this dish is not to overcook the fish fillet. On top of it, the soup base has to be clear, but not cloudy. You might like me imagining there’s a fish swimming in the pond while having it. Rinse the fish fillets and wipe dry with kitchen paper. Season with salt and pepper on both sides. Heat oil in a frying pan over medium-high heat. Cook the fillets, skin side first until lightly brown, about 3 minutes. Carefully flip them over and cook them for about 2 minutes, until they are just cooked. In the meantime, use another pan and sauté the garlic. Add the mushroom and cook until softened. Season with salt. Set aside. Use the same pan to cook the chicken stock with ginger over high heat until it’s reduced by half. Add the sauce and toss back the mushrooms. Cook for about 1 minutes and let the mushroom absorb the flavours. Transfer the soup and mushroom into two individual serving plates. Top with the fish fillets. Garnish with coriander. Serve immediately. I bought a whole snapper this time and fillet it myself. The bone was saved for cooking soup. For convenience, you can ask your fishmongers to help. You can use any kind of fish fillet you like. 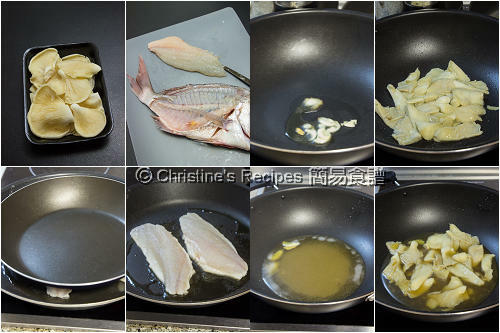 When pan-frying the first side of fish fillet, lightly press the surface with a large spatula, or a pan for a little while in order to help flatten the fillets. To get best results, use clear soup base for better presentation. It also helps to take the dish up a notch. My mouth is watering, Christine. The snapper looks so succulent and meaty. so you took the fish fillet off of a fresh fish?? That seems so difficult haha would this work with store bought fish fillets?? Christine, do you think it will work with other mushroom? Say the reconstituted shitake mushroom? Yes, it will work with shiitake mushrooms too. snapper is our favourite. By the way, do you think that the snapper is cooked enough as you just put a little oil and fry it in 3 minutes. 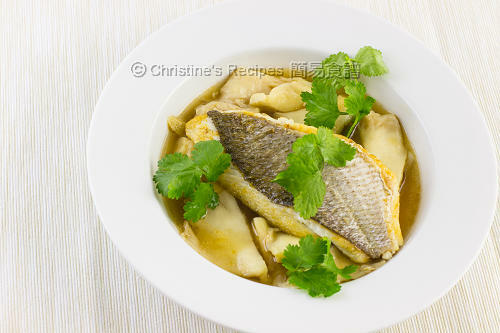 how if we put the snapper in the chicken stock? is it works? The cooking time depends on how thick your fish is. Sure, chicken stock will work too. I often use a chopstick to test the fish. If you can easily push through the chopstick, that means the fish is cooked. The fish should be just opaque throughout.